River Plate coach in waiting Néstor Gorosito has confirmed that the club will be forced to sell either Diego Buonanotte or Radamel Falcao Garcia in January in order to balance the books. Gorosito will inherit a River side that finished bottom of the Apertura tournament when he takes over at the turn of the year, and will face further problems with the news that he is likely to lose at least one of his two most prominent players in the winter transfer window. 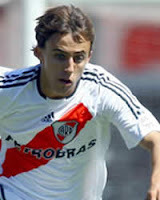 Buonanotte was River's sole shining light during their dismal Apertura campaign and the twenty year old, impish attacking midfielder is sure to attract interest from European clubs in January, with Napoli thought to be among his suitors. Colombian striker Falcao has previously been linked with Tottenham Hotspur and River would have no problems offloading the 22 year old should they need to do so, such is his pedigree in front of goal. "Falcao or Buonanotte will leave," Gorosito told reporters on Monday, although he also indicated that he hopes to bring in his own attacker and possibly a midfielder, with Internacional's Pablo Guiñazú heavily linked with a move to El Monumental.